Notes4Me is a powerful, easy to use app for creating notes to yourself. It fits in the space between traditional to-do list and notebook-style apps. It runs on the Mac, iPhone, and iPad. Creating and viewing important notes to yourself is a snap with Notes4Me simple and powerful user interface. Notes4Me automatically detects addresses, dates, phone numbers, flight numbers, and other information. Create new notes from within Notes4Me or use the share extension to create notes from within other apps. You can also share your notes with other apps from within Notes4Me. 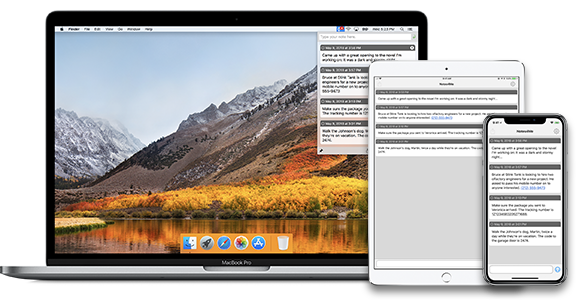 Notes4Me runs on the Mac, iPhone, and iPad. It supports syncing through iCloud, so your notes are always with you wherever you go.